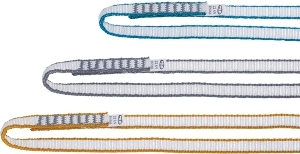 Dyneema loop sling 11 mm wide, available colours gold, gray and light blue. Available lengths: 30, 60, 80 and 120 cm. Breaking strength 22 kN.